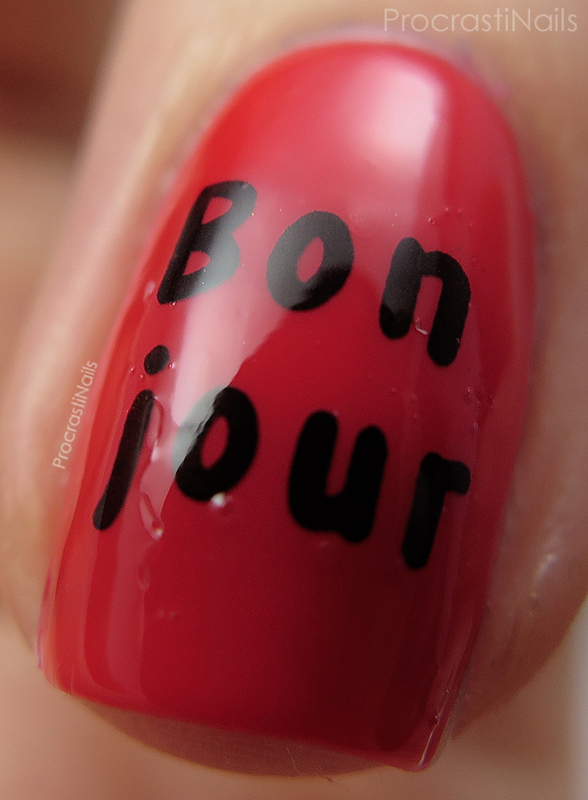 I know I say this a fair bit, but these are hands-down my favourite nails in recent memory! 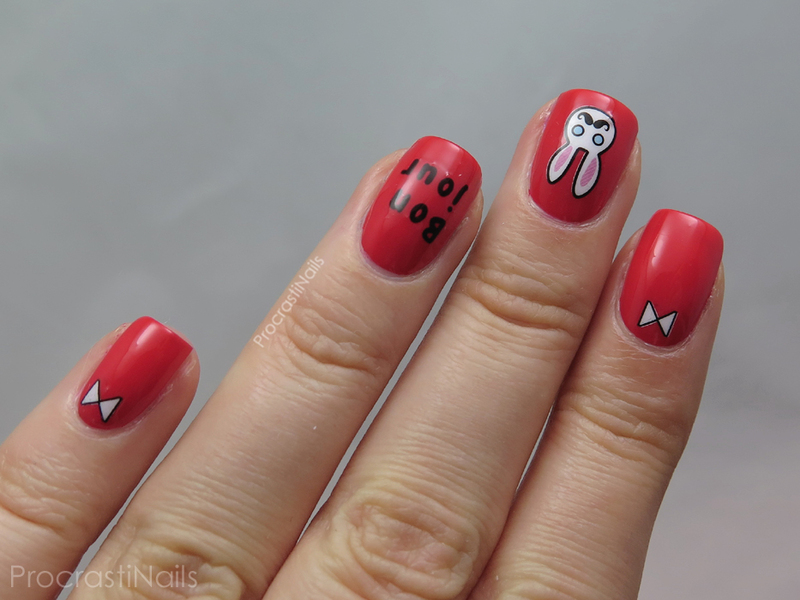 They were so simple to do and I almost cried when I had to take them off. What was it that got me? Was it the perfect apple red base? 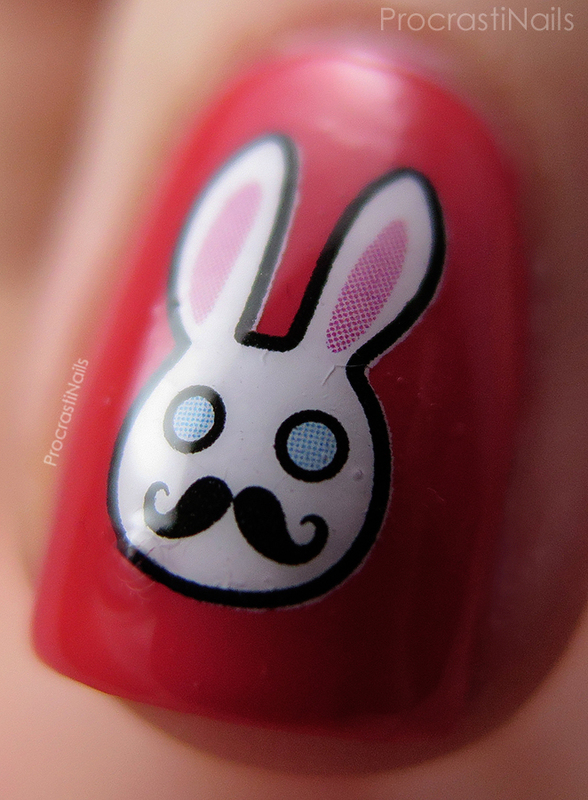 The adorable mustachioed bunny? The font used for the wording? I don't know! But I love it! Ahhhh! So I'll start off by telling you how I put this together. The base is two coats of OPI 5 Apples Tall from the Hello Kitty Collection, and irl it's slightly more orange-leaning of a red than the pink-leaning it appears to be here. Just slightly. I can't begin to tell you how happy I was when the white turned out white and not clear. So happy! I have named him 'Ralph.' Why? Why not! Ralph says "bonjour!" The decals applied amazingly, and I had zero issues with them laying flat or dissolving when I applied top coat (which are both issues I've had with other bps decals). I found I did have to soak them a little longer to get them off the paper but that may be because I've had them for like 2 years and never used them. Do decals expire? Hmm. I adore this! It's super cute & fun! No wonder you didn't want to take it off. 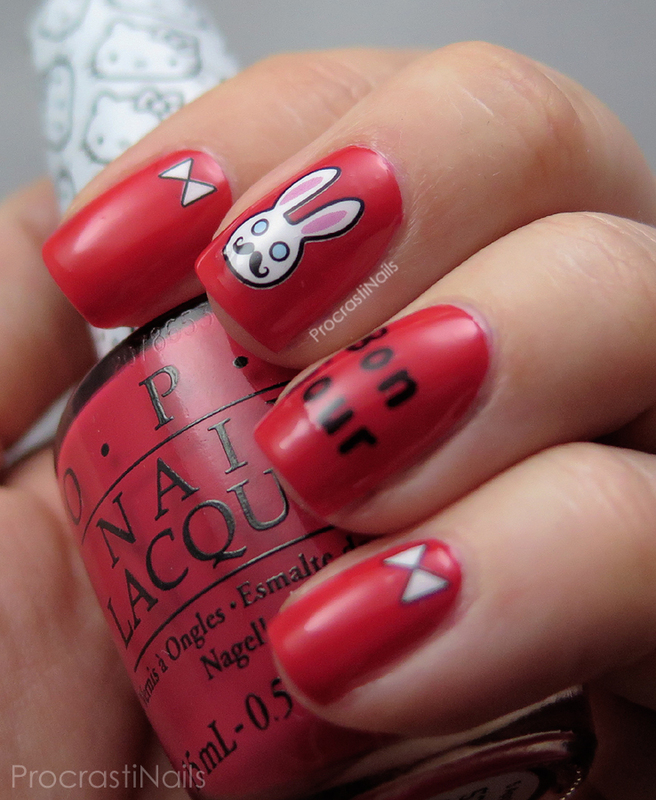 Those water nail decals are so cute on your nails. So Ralph is French! 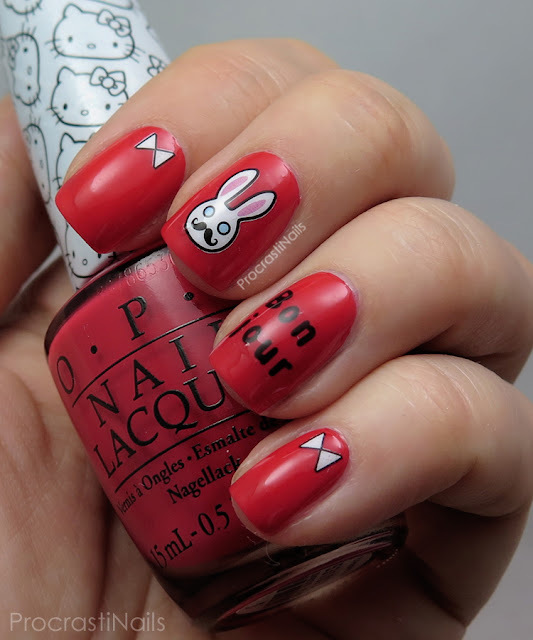 These are pretty cute! That bunny though! Oh my, so cute! 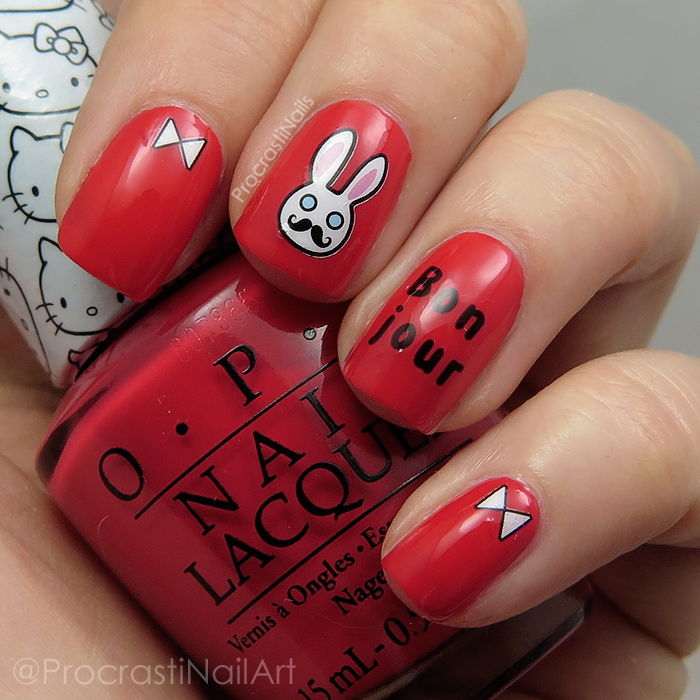 These are so freaking cute! Love it! Not to mention I love the base you used, I need to get my hands on this Hello Kitty collection. Gah, this is so stinking cute!! I love Ralph!! such a perfect combo, soooo cute!